1. 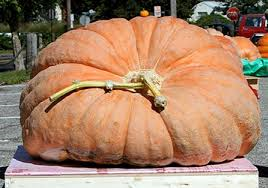 The world’s largest pumpkin weighs 2,032 pounds, that’s more than a ton. The average weight of a pumpkin is about 12 pounds. How many average pumpkins equal the weight of the world’s record? 3. Anoka, MN is the Halloween Capital of the World. They created the first Halloween parade in 1920. How many years will it be before they can celebrate their 100th anniversary? How many months? Think that’s scary, now try to figure out how many days? This entry was posted in Uncategorized and tagged Anoka, Halloween math, punkin chunkin, world's largest pumpkin. Bookmark the permalink.